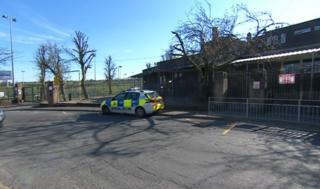 A 15-year-old boy has been stabbed at a school in Bradford. The pupil was stabbed in the shoulder at Beckfoot Thornton in Leaventhorpe Lane just before 11:35 GMT. He was taken to hospital but his injuries are not thought to be life-threatening. The school said student safety was its "highest priority". West Yorkshire Police, which was called to the school, said a male of similar age had been arrested and a knife recovered from the scene. Beckfoot Thornton was known as Thornton Grammar School until 2016. It is a mixed secondary academy and sixth form run by Beckfoot Trust. Head teacher Jeremy Richardson said: "There has been an incident at school today in which one of our students has been injured. "The student is with his family and receiving the necessary medical attention. Another of our students is with the police and they have started a detailed investigation. Mr Richardson said the school was liaising with police and is working to re-assure the "school community". He added: "The safety of our students is our highest priority and we know our school community will need to understand how this could have happened." Speaking outside the school, one parent, who preferred not to be named, said: "I think they need to put some very strict measures in place, I think every child should be scanned so we know what children are going in there with. "We haven't had any reassurance apart from the lady at the gate who said the children are OK, but other than that, nothing, which is appalling."